A burger done right is a great treat and their diversity, depth and basis for a number of topping, sauce and condiment combinations mean they're loved all around the world - there's few countries where you can't find a burger. It is of course America's favorite food and this infographic from Madgraphs sets out 10 amazing burger based facts that you may not know about the much loved fast food. For instance, did you know that the Big Mac was introduced in 1968 and the first ever version cost just 49 cents? Or the staggering fact that 71 percent of the beef served in commercial restaurants in America goes towards making burgers. 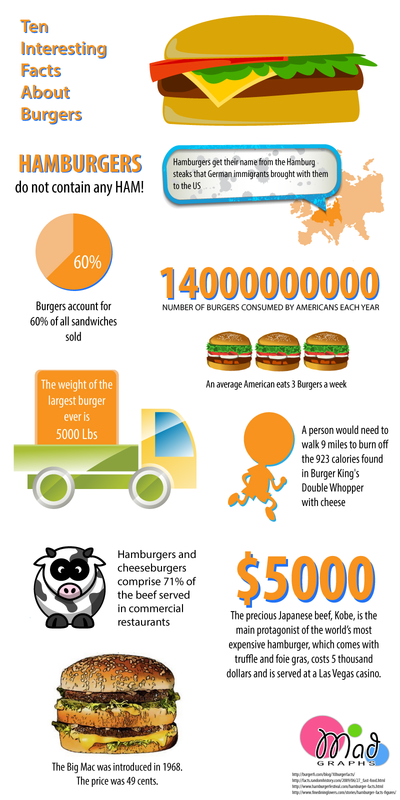 Take a look for yourself there's some interesting facts and it's always nice to know just how many miles it takes to burn of the calories of a double whopper.